Pani Puri Processing line uses wheat flour, potato starch, corn starch as main materials to produce a Variety of pellet food in different shapes which are popular in the market, such as crisp pea, shell, screw, square tube, round tube,wave, etc.This process line is characterized by unique technic, rational configuration, high automation and stablestable performance. It can finish steaming, extruding and shaping in one step without a boiler. The products have similar shapes to the real one and taste crisp and cious after fried. 1) Single-Screw extruder is mainly applied to make fry wheat flour food, which is made up of feeding system, extruding system, cutting system, heating system, driving system, and cooling system. 2) Feeding,main driving device, and cutting device adopt inverter to adjust the speed with more powerful drive, stable running, and low consumption. 3) Screw is made of alloy steel with long life. 5) Hanging mould and knives seat and bearing knife adjusting system can adjust the kniver exactly and swiftly. 1.Materials can be mixed equally in its tank. 2.Max Capacity can achieve 100kg/batch. 3.Easy and convenient to operate. Brand:Jinan machinery Extrusion Jinan Joysun Co., LDd. 1) Feeding, main driving device,and rotary cuting device adopt inverter to adjust the speed with more powerful drive,stable running and low consumption. 2) The barrel is allocated with six temperature control and automatic cooling devices for accuracy. 3) Hanging mould and knife seat can increase the speed of replacing mould and knife. 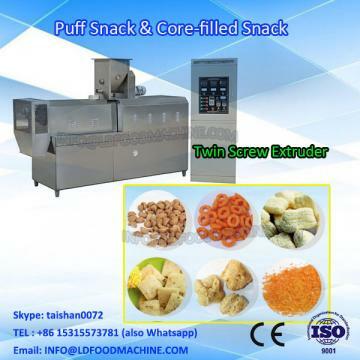 It is the matched equipment for double-screw extruder and mainly used to shape and cool the 3d compound extrusion food. Material is lead by cooling guide shelf to the shaper. Compact structure, easy operation, good figure, adjustable operation parameter are all its characteristics. High efficient diesel/gas burner can heat swiftly with low consumption and high heat efficiency. Hot wind cycle device makes heat Enerable equal in the dryer. Adjustable transit speed of conveyor belt with accurate temperature control device. Double-roller chain and chain drive make stable and smooth running. LDiding board bottom of dryer for easy to clean.